Why can't we see images reflected on a piece of paper? Why can't you see a reflected image on a piece of paper? Say you put a pen in front of the paper, even when light rays are coming from other sources, hitting the pen, reflecting back, and hitting the paper, there is no reflection. What's wrong with the following "ray diagram" and why such even don't happen and the image of the pen don't form on the paper (right side is a paper)? When then can you see the image of a torch when you shine it on the paper? 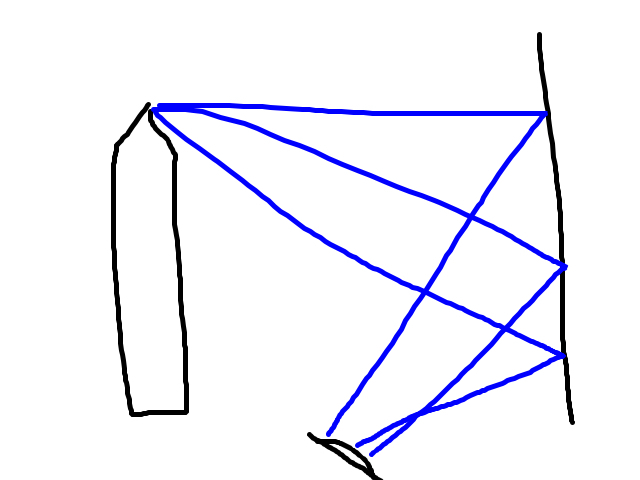 When you put a convex lens in front of the pen, why you can now see the image of the pen on the paper? Your pen is (presumably) not made of mirror-like polished metal, but rather of something like wood or plastic that reflects light diffusely. This means that the light from each part of the pen is scattered all over the paper (and, of course, in other directions too), so it won't project a clear image onto the paper. OK, so why won't the pen at least form a blurred image on the paper, then? Well, actually it does. Here's a photo I just took with my cellphone. Sorry that it's a bit dark, I wanted to make sure I didn't burn out any highlights. If you look closely and carefully, you can see just the slightest hint of yellowish color on the paper near the pencil, and a hint of red near the pen. Those faint colors are caused by light reflecting off the pen and the pencil onto the paper. But they're not very bright, because most of the light hitting the paper is still coming from other directions (primarily, from the lamp illuminating the scene), and not very distinct, because the light that does reflect off the pen and the pencil gets spread in all directions. There, I bet you can see it now. It almost looks as if the pen and the pencil were glowing... which, of course, technically they are. Not with their own light, of course, but with light reflected from the lamp that illuminates them, just like e.g. the moon glows with reflected sunlight. As a bonus, if you look carefully, you can also see some brighter spots on the paper near the pencil. Those are specular reflections from the glossy print on the pencil. So we actually have both diffuse and specular reflection demonstrated in the same picture. You will not see a real image of the pen forming on the paper, nor will you see a virtual image from the reflection of the pen from the paper. 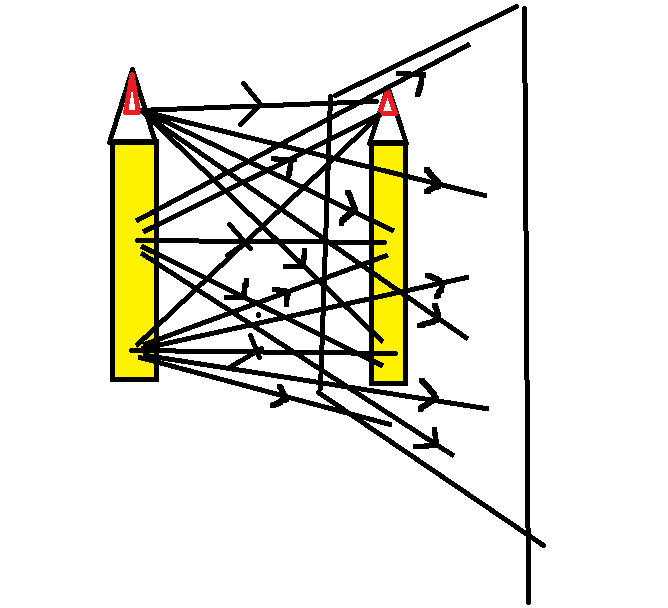 The reason you will not see a real image forming on the paper is that the light scattering from the pen is diverging, and in order to see an image all rays from a single point on the pen must converge onto a single point on the paper. That's why placing a converging lens at the right place will form an image. The reason you will not see a virtual image from reflection is that the reflection from the paper is diffusive and not specular, i.e. the incident rays are scattered randomly instead 'angle of incident equals to the angle of reflection'. A real image forms when multiple rays from the same point meet at again at another point. Without optical element, the rays just go in their own different directions and don't meet again. So there is no image. 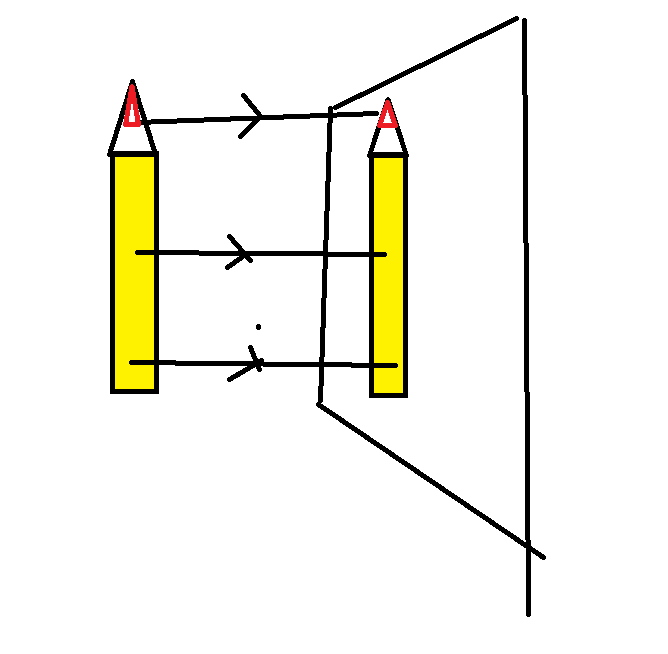 Because a convex lens bends the rays so that the diverging rays originating from any given point on the pen—as long as it is further than the focal point—start to converge on the other side. 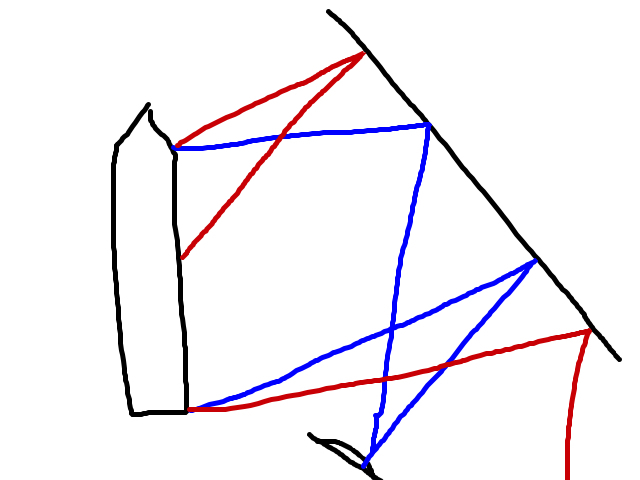 The basic rules say that a ray passing through the centre of the lens passes straight and a ray passing parallel to the optical axis on one side passes through the focal point. 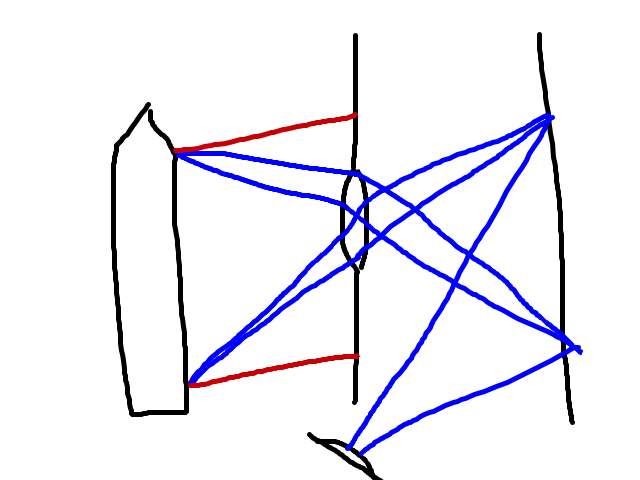 These rules allow you to trace three different rays through the lens and where they intersect on the other side, there is the real image (which you can see iff it coincides with a piece of paper). You could trace the other rays too, but that requires more advanced analytical geometry. I you are talking about a real torch—as in a stick with a piece of burning rag wound around one end—you won't. You'll only see a more brightly illuminated spot where the paper is closer to the torch. If you are talking about the electric kind, most of them are reflectors, that is they have a parabolic mirror mounted behind the light emitting element. The mirror should be mounted so that the light emitting element is closer to the mirror than the focal point, in which case there is no real image, but a virtual image behind the mirror. Virtual image can be seen directly if the light is not too bright to look directly into it. However sometimes the mirror is mounted too far from the light element—or can be positioned there in the variable focus lights—and then there is a real image ahead of the light you can project on a paper. In a mirror light is highly likely to reflect only in one angle according to the "law of reflection" ( I have no idea of why that is though ). On a paper it is likely to also reflect in all other directions. Therefore, on the paper, the image of the pencil is drowned out from the light hitting it from all other points in the environment. The light from each point on the pen will hit each point on the paper, and thus contribute to diffuse the image of itself. 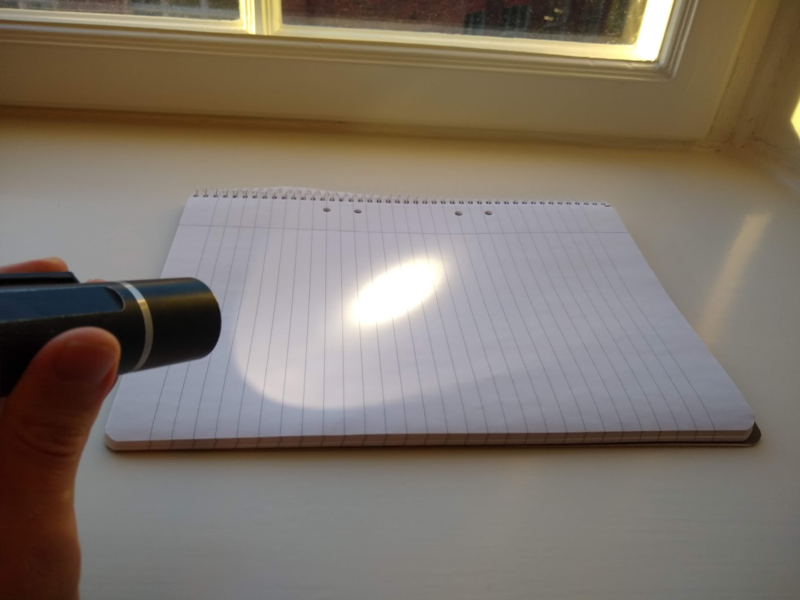 With a lens, you will only be able to see the image of the pen on the paper, if the only light that hits the paper is coming through the lens, or at least other light is sufficiently dim. Also the lens must be at the correct distance so it will focus all light coming from one point on the pen to one point on the paper. The reason you see a picture in that case, is because for each point on the paper, there is only one point on the pen (or whatever else is out there) as seen from the point of the lens, that will hit each point on the paper. This means that all light reflected from that point on the paper is coming only from one point on the pen. A torch will send directed light, thus light from one point on the torch only hits one part of the paper. Since the light is a lot brighter than the light coming from the environment, the light that hits your eye, will come from only the one point on the torch, thus recreating the round circle of the torch. Here are som drawings to illustrate. Blue are the rays that hits the eye, while red misses the eye. There are several things going on that make a mirror and paper reflect light differently. First, if you examine the surface of the paper under a microscope you will see a very rough surface. This roughness has the effect of scattering the light. Imagine trying to play ping pong on a table covered with rocks of all sizes. The ping pong ball would bounce unpredictably. The mirror, in contrast, is very smooth to light and so light can bounce off in a predictable direction. Another difference is the electrical conductivity of the material. Light is electromagnetic and interacts with electrons, changing their motion. Most electrons are bound to particular atoms and so their range of motion is limited. Electrical conductors additionally have some electrons that can freely swim around among the atoms. This additional mobility is visible to us by causing metals to have their luster. The silver in the mirror is a great conductor of electricity, and the glass keeps the silver smooth and protects it from being tarnished by air. The combination results in an extremely smooth surface with maximum metallic luster. In contrast, the paper is exhibiting another phenomenon. Light can be absorbed and its energy re-emitted as a color that has more to do with the material than the source of the light. This can be seen by examining many things under black (ultraviolet) light. Some objects will seem very dark. Others will glow white or a particular color under UV light even though the black light bulb does not provide that wavelength of light. This is particularly true of artificial products and their packaging that are tuned to be attractive to people. For example, compare paper and styrofoam that are both white under ordinary lighting. Under UV light, the paper will typically glow bright white but the styrofoam will appear dark and dull. This happens because the paper absorbs invisible UV energy and becomes a source of visible light. Some of this happens under ordinary lighting too and contributes to the brightness of the paper. The reflection at the surface or the screen. In the case of paper and the pen (1) is low, and scattered reflection in random direction for (2) makes it even lower, that's why the the reflection is barely visible. In the case of paper and the flashlight, while (2) is same, (1) is pretty high so we can see the flashlight in the screen. 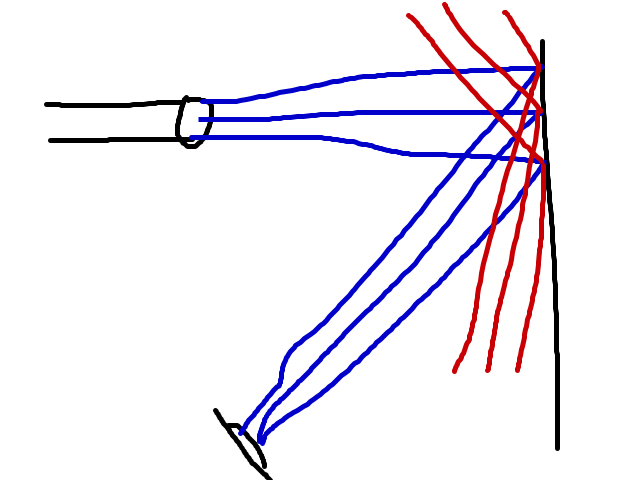 For a laser, (2) is even more intense, that's why even a small beam of laser can be seen clearly from all direction (the scattered reflection in (1) makes seeing uniformly from all directions possible). In the case of paper and the pen with a convex lens, while (2) and (1) are both same, the convex lens focuses every ray emanting from the pen to a single point in the screen (well this is an approximation but roughly OK), which makes the intensity very high. Now the thing is same as the that of the pepper and the laser light. I can't believe how much nonsense has been posted here and how many up-votes have been awarded to answers that are nonsense. We are told that it's because the pen isn't polished like a mirror rather than because the paper isn't polished like a mirror. That fails to explain why you can see a reflection of the same pen in a mirror. Light falling on a mirror is reflected in such a direction that the angles of incidence and reflection are the same. Light falling on a white sheet of paper is reflected but scattered, going in all directions from the point where it hits the paper. Not the answer you're looking for? Browse other questions tagged optics everyday-life reflection or ask your own question. Why can't we see real images? Why do we need screen to see real images? What causes this pattern in the reflection of a laser on a screen? Why does roughened silver look gray while paper white? Why do light rays going to infinity form a real image? Why can we only “see” reflected light?